If you’re looking to sell your rental property and stop landlording, you need your property to be vacant. If your tenants are nothing short of aggravating, you might wish you could sell them with the house. While our company buys tenant occupied rental properties, many other investors in your area may not. You’ll have limited success attempting to pawn them off on someone else. Not only will you want to get rid of them quickly, but you’ll also want to get rid of them peacefully. Bad tenants get rowdy, and you may need to be willing to compromise if you want a smooth transition. You catch more flies with honey than you do with vinegar. You can’t forego that by smashing all the flies. The flies in this case are your bad tenants, and you need to treat them with kid gloves. You might feel tempted to go on a rampage and tell them you’ve had it, but don’t give in. You’re walking a fine line, and the only thing you can kill them with is kindness. If you let loose, you have to be worried about actions of spite. You don’t want them to damage your property, leave it in a deplorable condition, or take their anger out on you. You need to find the right balance of firm and polite. Before you announce to your tenants that you’re looking to get them out of there, you need to check the property.Check your appliances, and inventory the things on the property that belong to you. Check walls and floors for scuffs and dents. Make sure nothing is broken. Take photos, in case you need them later. If your tenants get angry and damage anything, or leave your rental a mess, you’ll have photo evidence.Knowing that you inspected may be enough to prevent any acts of vengeance.Your tenants will probably want their deposits back. Some won't care, and those are the tenants you need to watch out for. Lease violations are the easiest way to evict someone. Think about stipulations in your lease about illegal drug use, or guests that stay too long. Maybe you’ll find evidence of a pet you didn’t allow.Things like nonpayment of rent or frequently late payments are easy enough to document. You want to find every violation that you can to prepare the strongest case. If there’s unsavory activity going on that isn’t specified within your lease, you may have your hands tied in that department. If the activity is illegal, that becomes another can of worms. You cannot blackmail your tenants, but you can alert the authorities. If you only have suspicions, your tenants will probably be more compliant if they’re trying to hide something. They’ll do their best to avoid having police serve them notices or assist in the eviction process. Once you know what thing or things you can evict them for, it’s time to sit them down and have the talk. If you don’t feel comfortable in person with your tenants, a formal letter or a phone call may be your best option. The key to making this is a successful discussion is the tactic you take, which is partially why monitoring your attitude during the process is so important. You’ll want to be sympathetic, calm, and kind when speaking with your tenants but with a firmness that shows you're not a pushover. You can jump for joy and break out the champagne once things are over, but don’t channel your anger into the discussion. You’ll need to outline the grounds for eviction, and try to come up with a compromise if possible. You may not have all the time in the world to get them out of there, but your tenants will probably be more compliant if they can collaborate with you on their exit strategy. 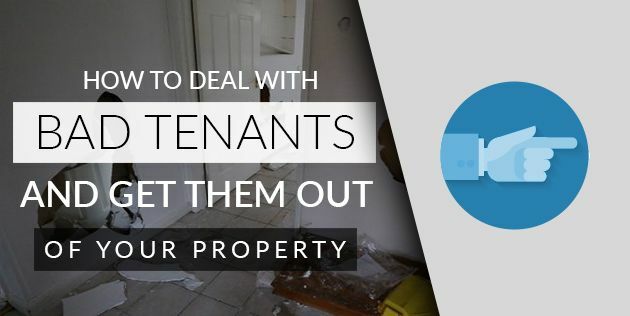 If you find that your best efforts to create a peaceful resolution to the situation are being prolonged by tenants that are taking advantage of you, you still aren’t out of options. There are other strategies you can use to get them out the door. Cash for Keys is relatively common when a landlord wants to get rid of a tenant. This is helpful when there aren’t any clear lease violations, when a tenant wants to protect their property from spiteful tenants, or when a landlord is looking to expedite the process significantly. What goes on in a cash for keys scheme is quite simple – you buy the tenants out of their lease. In exchange for your tenants moving out, you pay them. Agree on a conditional time-frame, and give them a the money if they vacate the premises on time. The last thing you need when you’re burned out is an ongoing legal process. It’s stressful and complicated. Your tenants probably don’t want to go through that any more than you do. Remind them throughout the process that you don’t want to go that route. They’ll be more receptive to what you have to say. They don’t want an eviction to show up on their record – it will make it difficult for them to find a new place to live. If your tenants are behaving awfully, you may have no other choice but to go the whole nine yards. You should always prioritize your safety. It’s better in the end to walk away intact and on top with a little more stress than to face harsh or potentially dangerous situations due to the behavior of your bad tenants. Some investors are able to not only buy your home, but take your tenants with them. The benefit for you here is the process will eliminate pretty much everything listed above. Once you agree to sell the property you will only have to inform your tenants that the property is being transferred to a new landlord and you can wash your hands of it. Not all investors are willing to do this so you will need to speak to several companies to find the right one for you. If you're located in the Southern California area, we would love to talk to you about taking over your rental and tenants. You can either call us directly at 951-331-3844 or click here for more information.